This shower panel arrived quickly and is a dream to use. The body sprays are just powerful enough and I love the long hose on the handheld shower. Six fully adjustable perimeter body spray massage jets in the VIGO Elena Shower Massage Panel invigorate your everyday shower experience. An adjustable, multi-function rain showerhead and a hand shower with a 60 inches chrome plated brass hose complete the panel. Panel is pre-plumbed for easy installation. Dimensions 1.0 In. X 10.0 In. X 62.0 In. This shower is wonderful! I was surprised that all the showerheads can be used all at once (and the pressure is still strong)! The rain shower head is big and the water flow feels great. The massage heads are strong and angle any way I wish. I also like that I can turn the dials to stop the water flow to any or all functions without turning off the water temp mixer and conserve water while lathering. I had the unit professionally installed and the installer said it was an easier job than he thought. Everyone that sees it agrees this is an "impressive" shower unit. I had considered another multi-function shower unit from Overstock but procrastinated and that unit sold out. I'm glad I quickly moved on purchasing this unit . We're remodeling a bathroom and I wanted to make it as spa-like and luxurious as possible. After reading many, many reviews on this and other websites, I settled on the Vigo Shower Panel with Rain Shower Head. I chose this particular shower panel for several reasons (1) impressive in appearance - all aluminum...no plastic that I could see, (2) large rain head shower, (3) large rain head hand held shower, and (4) the fact that you can control the water flow to use all of the functions or just those of your choice. We are having it professionally installed and the plumber was very impressed- both with the way it looks and with the price point. I would definitely recommend this model. We love this!!! I never thought that each of the jets and the shower head, coupled with the handheld could deliver SO MUCH Water Power all at once. Each set is also INDIVIDUALLY controlled so you can use just the jets or just the head or just the handheld, or any combination. The plastic frame is sturdy and thick. Our box arrived broken, but the shower panel is excellent. We have NO COMPLAINTS with any of it. We also love the shiny chrome "brightwork" that we wipe with a towel to keep it bright and the shampoo shelf is very handy and works fine. The plumber had some difficulty with the assembly - instructions were very thin. I have found Overstock's RETURNS POLICY to be the best in the business. No one should be waiting for a replacement. Just call!!! I have done this with my many Vigo products that always seemed to arrive with some problem or other, but Overstock took care of the replacement within DAYS and I am very happy! This shower unit is very cool. Its functional & luxurious. It has several options: a very large rain shower head, 6 body sprays, and/or a shower hand spray. I had no idea that I would enjoy this shower unit so much, but its so fun - I take much longer showers. Wow! Within two years of installation, multiple hoses behind the panel burst sending full pressure water cascading down between the tile shower wall and the sheetrock, untimately to the kitchen ceiling downstairs! After researching this product's problems, apparently hoses bursting is a COMMON event, coupled with finding new hoses! What an ordeal! Reinstalled the unit temporarily (without the body jets operable) until we find a replacement which will fit the tile opening - just hoping we find it soon! Don't waste your money on this - Vigo needs to provide quality hoses and redesign the plumbing configuration! I have purchased several of these for clients. Everyone loves the look, loves the shower massage. Performs better than some of the more expensive shower panels on the market. We purchased this because we have a small shower and were able to put this in the corner - giving us more room. It works exactly like we thought. It provides us more room and extras like the jets. We priced out purchasing new valves and fixtures and this was only $25 more - well worth it! We were redoing the entire shower, so we hired a plumber (friend) to move the water outlets, but the rest of the installation was very easy for us to do. The panel is lightweight, but made well. We have been using it for about 2 months now and have no problems with it. It looks really sharp in our new shower. Wish I had bought it the first time! We bought this to replace a poor quality shower panel that gave us trouble from the first moment- (leaks in the hoses, very sharp edges and the final straw was thermostatic breakdowns) This is the third Vigo product we have bought and it is fantastic. Yes, there are plastic parts on it. It still looks great. We got it installed in a couple of hours, and the scariest part was drilling into the tile. Three weeks later we are enjoying a great shower that lets us have the shower, hand shower and spray jets at the same time with very good water pressure. We are very happy with the purchase. I put this in a corner shower stall, and it works well, my wife enjoys the body sprays, as do our guests; I use it as a normal shower, and it works fine. Note: The better your water pressure, the better and stronger the body sprays will be. You may need to periodically clean the heads if you have hard water, as they will clog up with mineral sediment. The only real problem with this shower is a simple design issue: the knobs aren't clearly marked, so it's hard to figure out which knobs are for which sprays, with the result that the whole bathroom has been repeatedly soaked with water from the body sprays spraying all over the bathroom if the shower door is open for even a second. If you turn on the shower and unknowingly get hit with the 6 body sprays it's a shock! The knobs need to be marked in a way that is visible! Perfectly completes the master walkin shower -being new construction- installation was easier as it was plumbed for this unit. 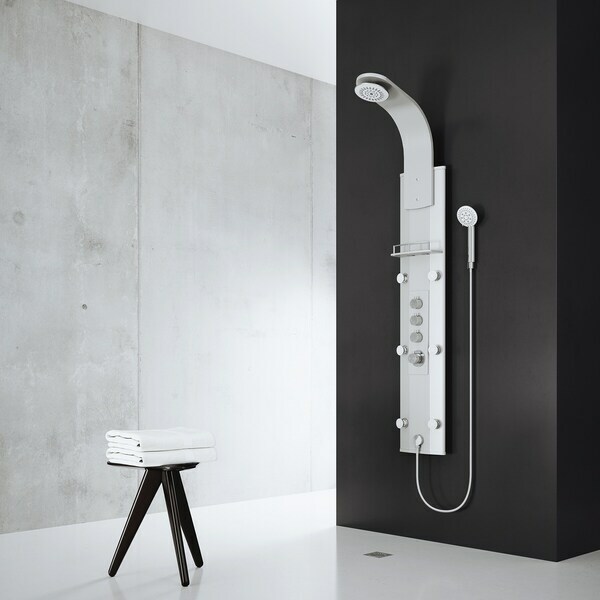 The until is a clever unit that is designed to replace your existing shower head, right that wall. It's long, so first thing, you need to make sure you have enough room under the pipe to your water valves. It's pummbed out with plastic tubing, not metal. Make sure they are tight. It requires at least two substantial screws to bolt it to the wall. Not always easy. It's removable and reverseable, so if you don't like it or it breaks apart (like mine did), all you have to do is patch a couple of holes. But, this thing is made of plastic. The shower head is wonderful, but it's made of plastic and it eventually will rupture, so the water goes spraying all of the the place and there isn't enough water pressure for the other shower heads. Cool idea, poor execution. If it was all metal, it would have to cost $1000 or more, that's the only way I'd buy another one of these. IT IS A TOY !!! Just problems. The shower head did not work properly since the beginning. It is all plastic. Shower head and jets were clogged from the beginning. The handle on the mixer broke in the first year and now we have three orange plastic hoses in the back busted at the same time. Can not use it any more since there is no generic replacement hose that can fit and the manufacturer is not showing much interest in sending the replacement ones. Very disappointing! Need to get a new one but afraid it will just be another junk! My husband did the instillation for this and had no problems. The panel is not 100% metal, the heads are plastic and the part attaching the main shower head, but we expected that based on the reviews. It is also true that the water pressure does decrease a little if you use more than one of the functions at a time, but we find them so strong in the first place the we've been keeping them turned down a little anyway so the drop is actually not an issue...plus, that should be expected. We didn't logically think that it would maintain the same level of pressure. Overall, we love it and have been super excited every time we've gotten into our new fancy shower! For the price, I don't see how any of the above could be considered a complaint since we shopped around a lot and this was definitely a good deal. The only thing I can't speak to is how it holds up over time. We really love this addition to our walk in shower, we had our handyman set in into the existing tile and it looks beautiful and works great..! Would recommend this to anyone looking for great massage that you get with this shower panel. My husband loves this Shower Massage Panel especially the rain shower head. Only wish water temperature was dispatched. We bought an old 1930's home, and remodeled both our teen son's bathrooms. They both got these wonderful showers installed in their bathrooms. Love them! Perfect. Our second version of this same panel we had for ten years at our old house. The wife and I feel like we are in a spa every night! This item has been in use at my house for 7 years now. It is lasting well. The jets don't work that great but it may be our water pressure. The rain shower head works perfectly and the hose works great. No issues in 7 years. Great value! I have had itfor11 years and still works great! Jets don't have the force I had hoped for but it may be more of a plumbing issue rather than the product. However, I love the separate wand &amp; beautiful shower head. "HELP,!! WE REDID A GUTTED HOUSE. AFTER HOOKING-UP OUR NEW VIGO SHOWER PANEL W./ RAIN HEAD MASSAGE SYSTEM, WE FOUND OUT THAT THE MIXING VALVE DOE`S NOT WORK ! IT STAYS COLD , WHAT SHOULD WE DO ?" "HI, WE JUST FINISHED OUR SHOWER REMODEL, AFTER HOOKING-UP OUR NEW VIGO SHOWER PANEL W./ RAIN HEAD MASSAGE SYSTEM, WE FOUND OUT THAT THE MIXING VALVE DOE`S NOT WORK ! IT IS EITHER HOT OR COLD , WHAT SHOULD WE DO ??" Hello vinnyswf, you will be contacted by Customer Care. "How much water pressure is needed to run the heads? We will be using a well and that is a determination on which shower head we pick. Thanks! Julie"
Hello Julie R., thank you for your inquiry. Unfortunately, the information you have requested is currently unavailable. You will receive an email notification once an answer is posted. Have a great day. "How massaging are the jets? 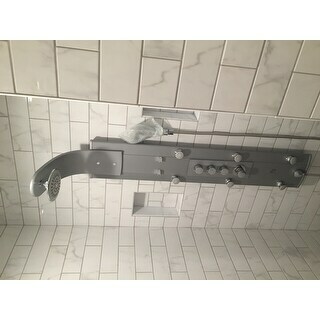 Also would I be able to remove this and replace it with a regular shower head when we move"
Hello Kpryor127, the body jets shoot a straight stream and the pressure can be adjusted on the panel, you can swap out the shower heads(depending on the model) but you would have to make sure the fitting fits on the thread. Thank you for shopping with us! "Is the face of the panel removable for plumbing access?" Hello Cathynrobby, the face of the panel does not come off. Thanks for shopping with su! Because of the ability to use more than one shower head system at the same time and for the one main temperature control. Ordered a VIGO shower panel for my last home, absolutely loved it. Quality and function were excellent, and it looked fantastic! Pretty easy to install to! "Can you please send me the installation instructions." Hello hnch, you will be contacted by Customer Care. Have a great day.